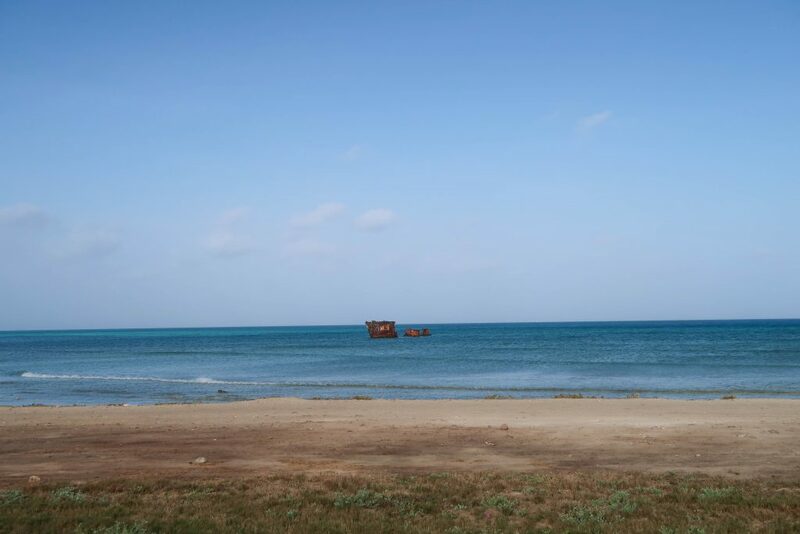 When I look through this post, I really have no idea how I have so many photos when I was only in Aruba for 2 whole days. But it’s proof of how much I loved it. I FREAKING LOVE Aruba. I love the Caribbean in general, but Aruba is something special. I’ve now been to Jamaica, Dominican Republic, Anguilla, St Martin, St Barths and Guadeloupe, but even after only having two full days in Aruba, I truly cannot wait to go back. If you’ve never been to the Caribbean, it should absolutely be on your bucket list. The water is stunning, the people are friendly, the food is delicious, and the beaches will make your jaw drop. But the best part of all – it’s an amazing place to stay healthy while on vacation. 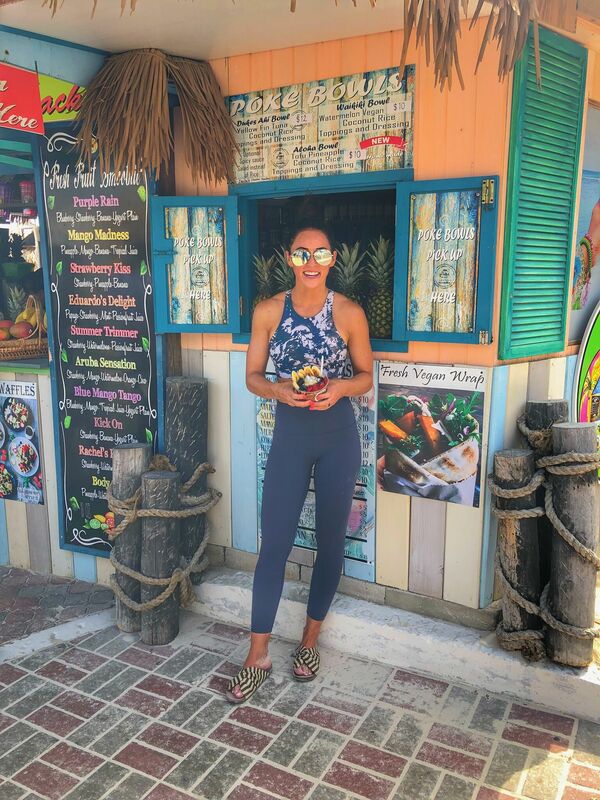 Every time I’ve gone to the Caribbean, it’s been super easy to eat healthy and continue with my fitness routine. 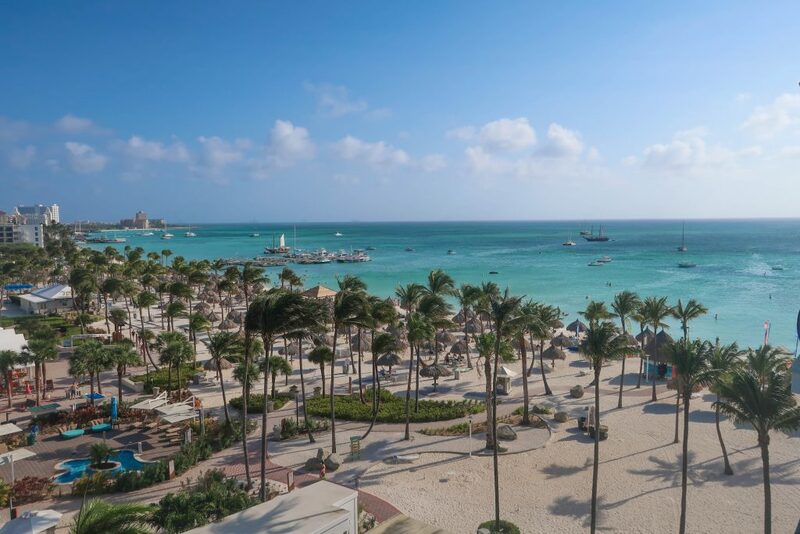 But this trip to Aruba was the easiest yet since the Aruba Marriott Resort & Stellaris Casino is all about supporting it’s customers fitness goals and healthy habits throughout their resort. 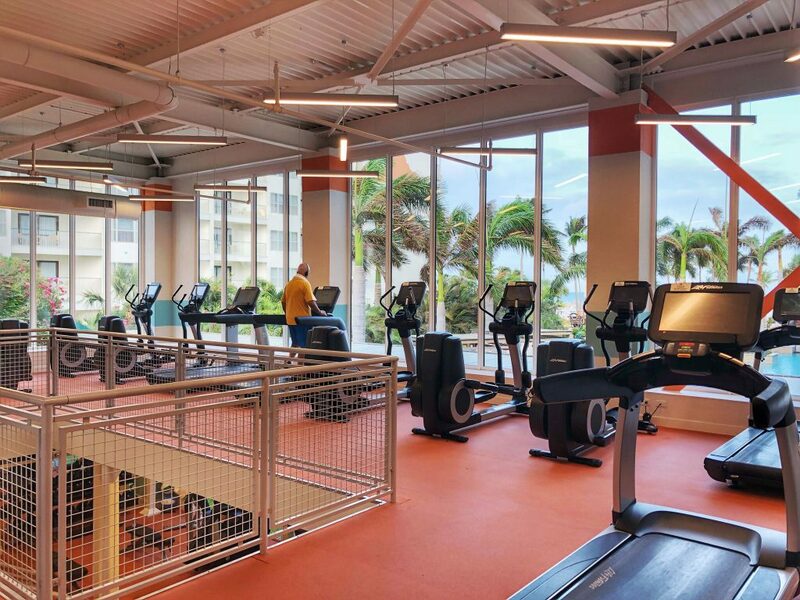 The Aruba Marriott Resort offers a beautiful beach for morning runs, a HUGE 2-story gym filled with cardio equipment, free weights and complimentary fitness classes (see my workout in their gym here), along with a beautiful spa to rejuvenate in afterwards. But one of the coolest events they sponsored this year was the KLM Marathon which started at the front door of the resort! Can we please just take a second to soak up that view from our room?? Perfection. This trip came up pretty last minute so I ran the 5k to keep it simple. But it got me thinking – how sweet would it be to train for some sort of race in a beautiful place then end it all with vacation? I see people train for races in Colorado constantly or will even go to the mountains sometimes to run a marathon, but what about taking those fitness ambitions out of the country? If I’m going to train for a 1/2 marathon or even a full marathon, I want to enjoy every minute of the view, not see the same streets of my hometown that I see every single day. Then once you finish your race, you have the rest of the week to soak up the sun, sip on a cocktail, and revel in the accomplishment from earlier in the week. Sounds like the perfect vacation to me! The KLM Marathon was such a cool event to take part in! The full marathon runners started super early at 3:30 in the morning and us 5k runners didn’t have to start until around 7:30am. 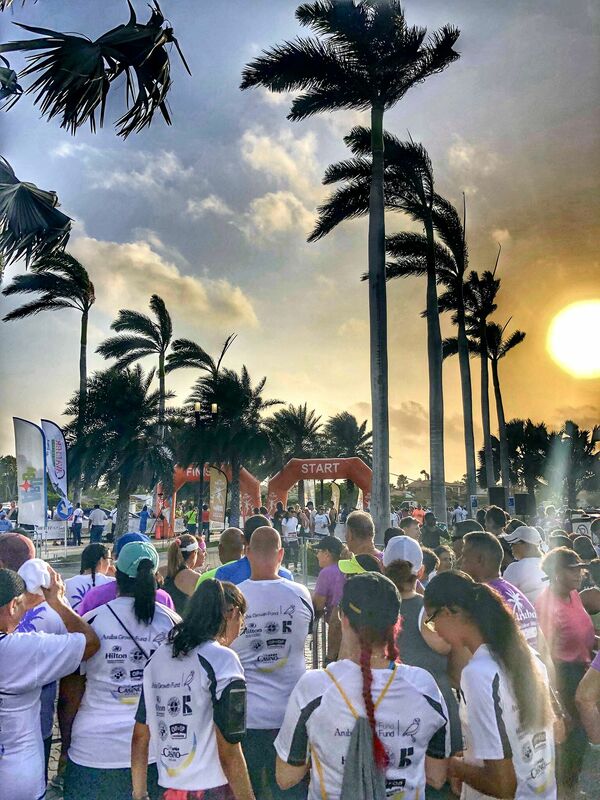 The race was filled with all sorts of different people – people walking with strollers, grandparents walking with their grandkids, runners, sprinters, and everyone in between! You could get as competitive as you wanted or you could simply get a run or walk in before your day on the beach. And after you finished your run, you were greeted by volunteers ready to pour water down your back to cool you off…and a firetruck with it’s hose out like a shower head. They made it super easy to cool down. And after you cooled down and fueled up with some snacks, there was a party on the beach with music and all sorts of fun people from the race. The views throughout the race were outstanding and it kept me motivated and excited for the entire race. I’m not huge into running, but I love doing anything that will keep me in shape while I’m traveling and I loved every minute of this 5k. 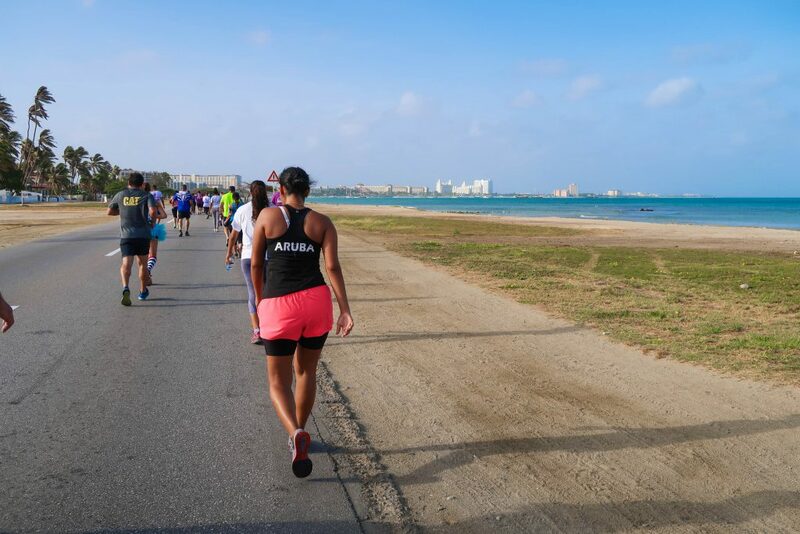 I seriously couldn’t stop smiling knowing that I was in Aruba while running a race. 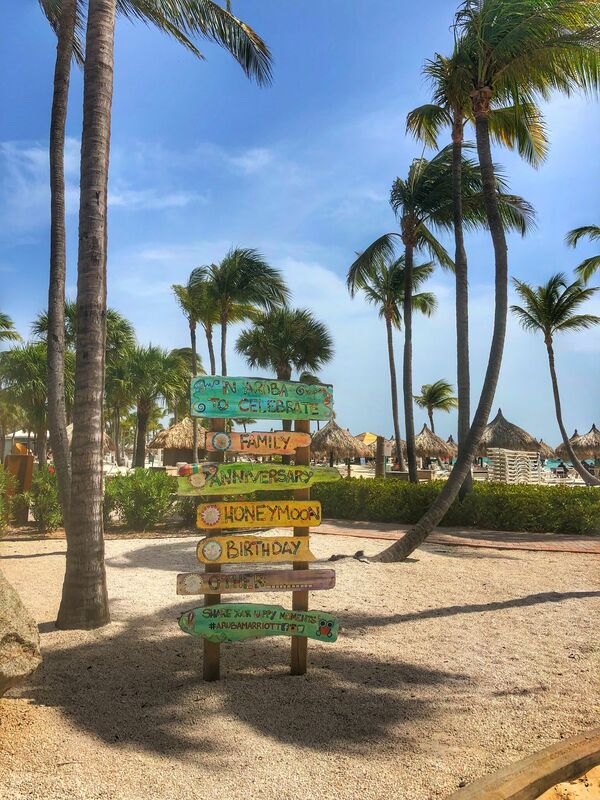 The exercise didn’t feel like a chore, it felt like an opportunity to be outside to enjoy every minute of the amazing Aruba sunshine. And working out that morning kept me on track with my healthy habits and behaviors for the rest of my short trip! Well honestly, the Aruba Marriott Resort kept me on track. 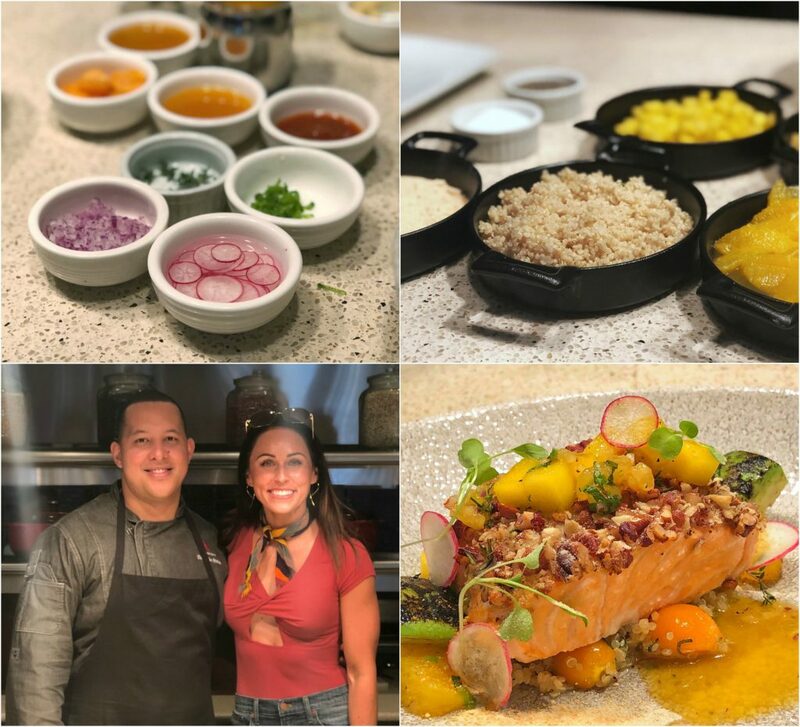 Not only did I run a race while in Aruba, but I also took a cooking class with executive sous chef Ever de Peña! 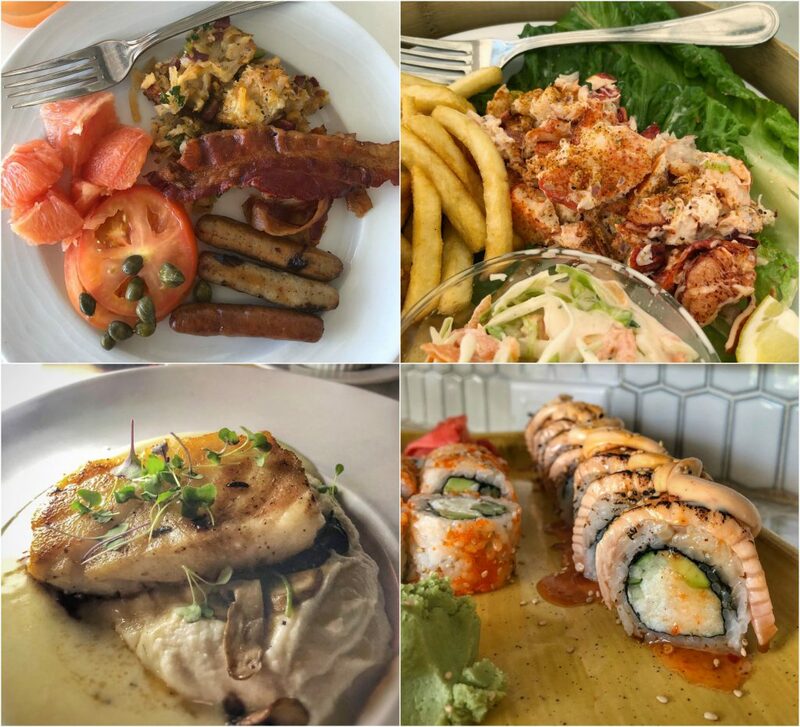 At the Aruba Marriott Resort, they are all about cooking with clean, fresh ingredients and it shows in anything you order there. 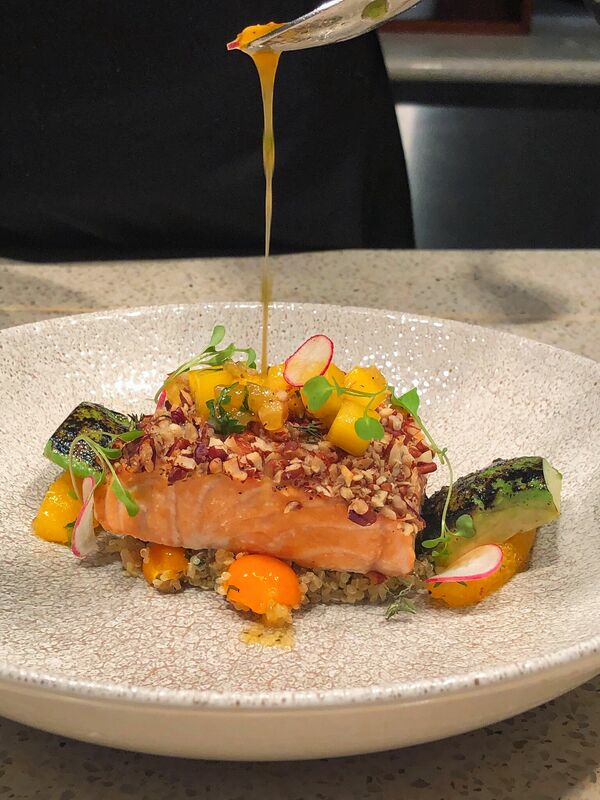 Ever de Peña showed us how he made his pecan crusted salmon on top of quinoa with a pineapple salsa and charred avocado. It was UNREAL! He made a light sauce and topped it all off with dried grapefruit powder. All the spices and sauces created the most amazing flavor profile that I hope to recreate back on home. It was super eyeopening to see how a chef creates his own recipes and where he gets his inspiration from. And it was definitely one of the most delicious pieces of salmon I’ve ever ate! And the rest of the trip was filled with just as tasty meals! The Aruba Marriott Resort has a bunch of different restaurants to choose from. You can check out Ruth’s Chris Steak House, La Vista for their all-day restaurant which offers a gluten-free bar, Atardi for an amazing meal on the beach with your toes in the sand (where I had the most AMAZING sea bass), Waves Beach Bar & Grill for quick and simple lunch like their lobster roll which I ordered in a lettuce wrap instead of bread, The Lobby for an amazing cocktail and fan-freaking-tastic sushi, H2Oasis Adult Pool Bar for afternoon drinks, Starbucks® for your morning buzz, and their Gelato & Co. for the most delightful gelato and gelato pops! And if you walk the path just a 1/2 mile down from the hotel, you’ll find the cutest beach shack of all time – Eduardo’s. 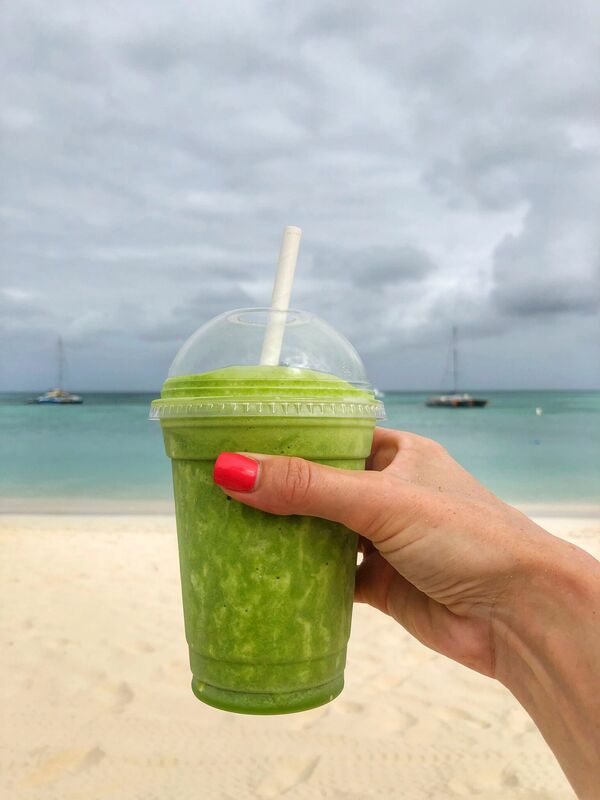 While I was traveling in St Barths last summer, I came across Tom’s Juice Bar and fell in love. And Eduardo’s brought back all those feelings. 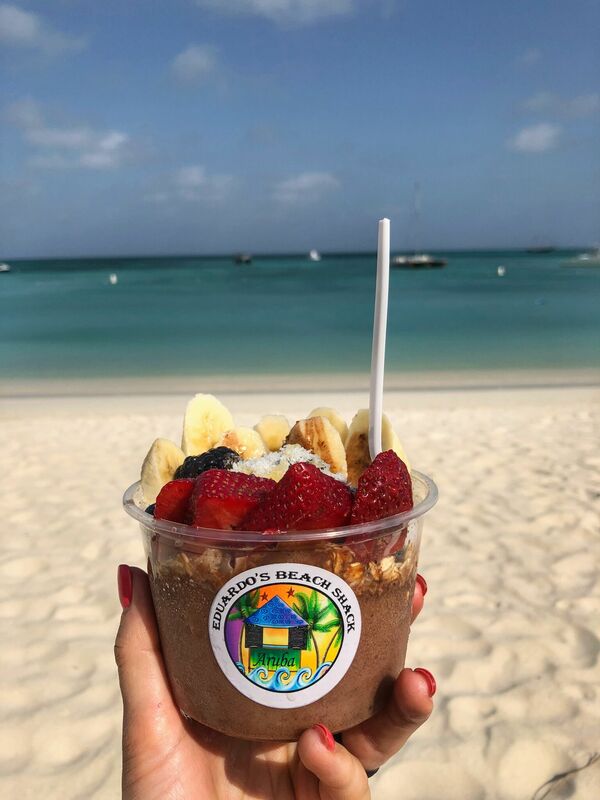 This beach shack offers açaí bowls, smoothies, protein bowls, protein bars, energy balls, vegan snacks, waffles, poke bowls, and a million other amazing snacks that you can feel good about eating. After wandering there right we finished our race and falling in love with our chocolate bowls, we went back the next morning and I loaded up on a green protein smoothie along with GIANT energy balls. Which were a lifesaver that night when we got stuck in the Miami airport and were in need of some healthy snacks. So HUGE thank you to Eduardo’s for keeping us healthy when there were only crappy snacks and sketchy fast food around. 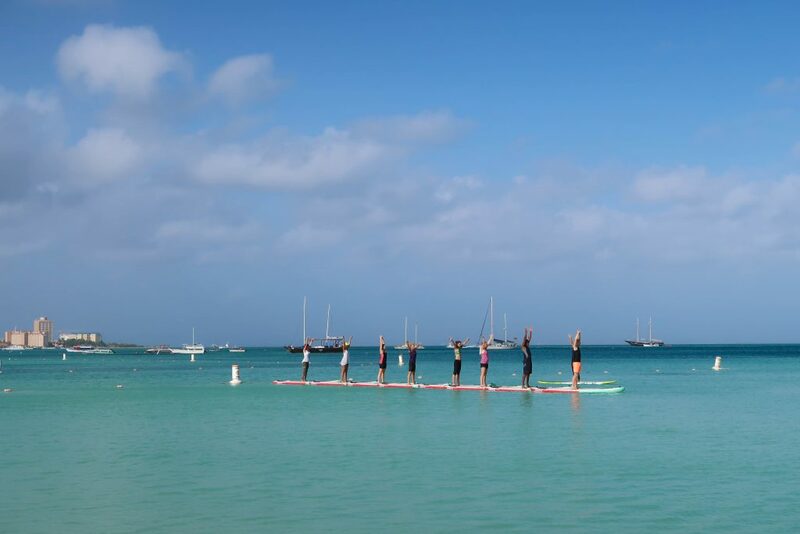 Another way we stayed healthy while in Aruba was by taking a SUP yoga class with Vela Aruba. 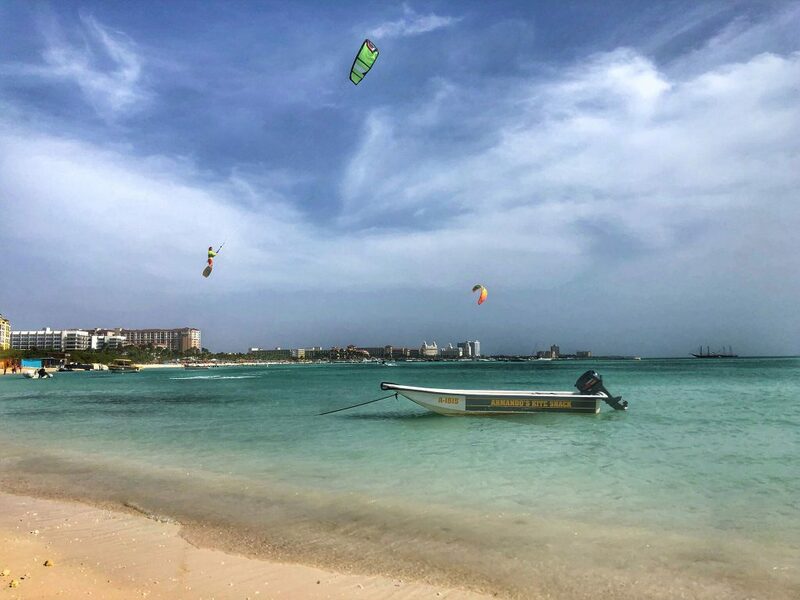 They offer windsurfing, kitesurfing, hobiecat sailing, SUP yoga, SUP bodyfit, beach yoga, and paddelboarding! They got it all! And everyone on their team is friendly, excited to teach you, and ready to get you feeling your best before your day on the beach! Our SUP yoga class was coached by a fellow CrossFitter (who ended up getting third place in the KLM 1/2 Marathon – what a badass!). If we would have had more time there, I totally would have taken the SUP bodyfit class, which is like boot camp, but on a paddleboard! 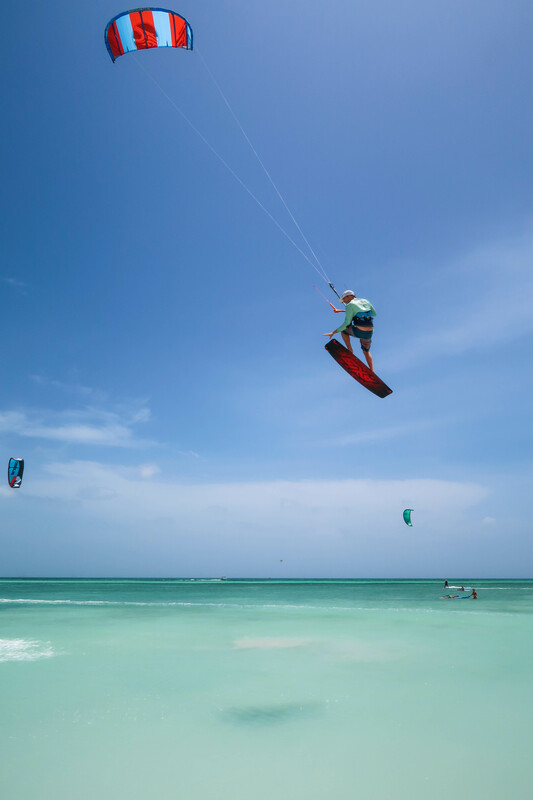 And one of the main reasons I plan on making it back to Aruba again next year is to finally try out kitesurfing. As we wandered just a little bit down the beach from our hotel, we ran into Armando’s Kite Shack where many people were taking lessons and the professionals were crushing it. It was so amazing to watch and we spent a few hours just watching the kite surfers fly into the air. Check out this photo below – this badass dude is flying! He’s flying!! I wanted to take a lesson so bad, but I would rather take a few lessons back to back to really get the hang of it. 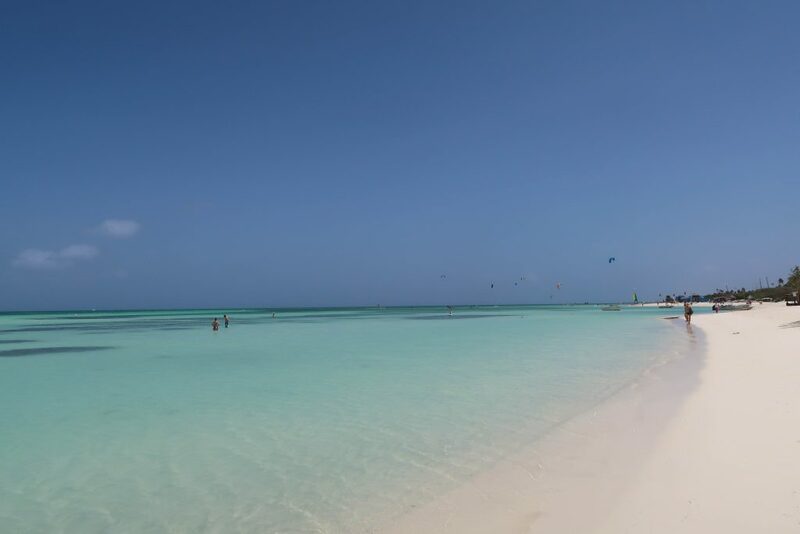 So I guess it’s time to start planning my next trip to Aruba! If you’re looking for an excuse to make it out to one of the most beautiful places on earth, look no further! 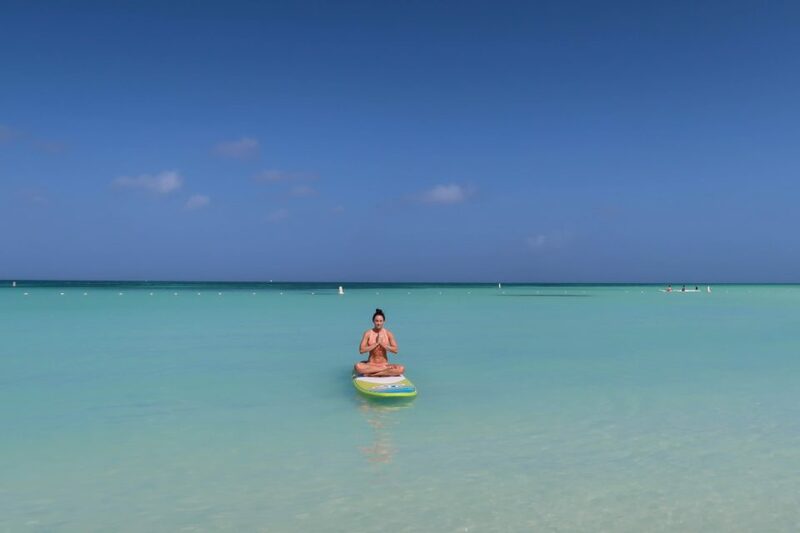 Start planning for your trip to Aruba today and begin your training regimen now! After running the 5k in the KLM Marathon, I already want to train for a 1/2 marathon (which I never thought I would do after running my first 1/2 marathon back in 2009!) to run next year in Aruba. 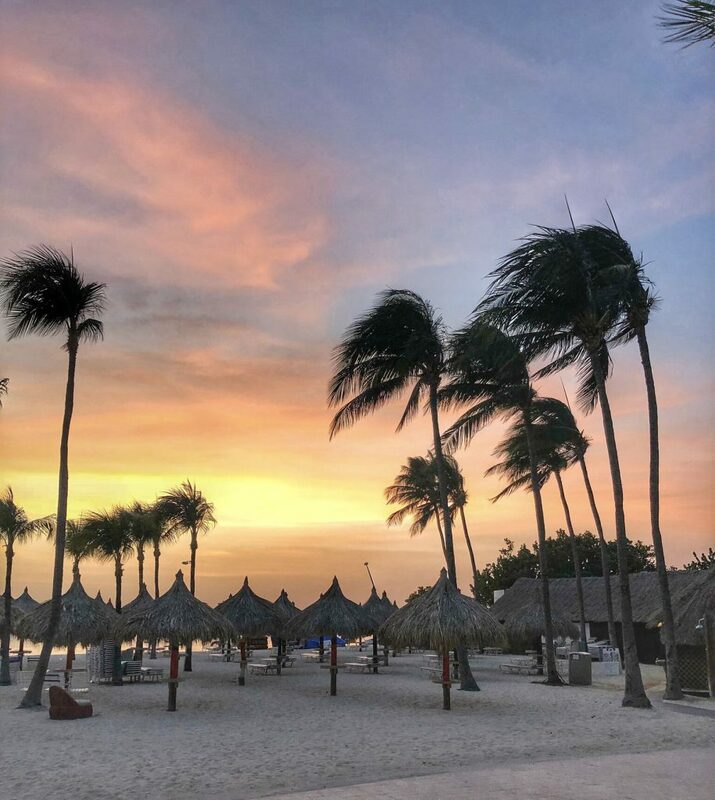 The Aruba Marriott Resort & Stellaris Casino is prepped and ready to make sure that you not only enjoy your vacation, but that you feel your best throughout and leave feeling even healthier than when you arrived! 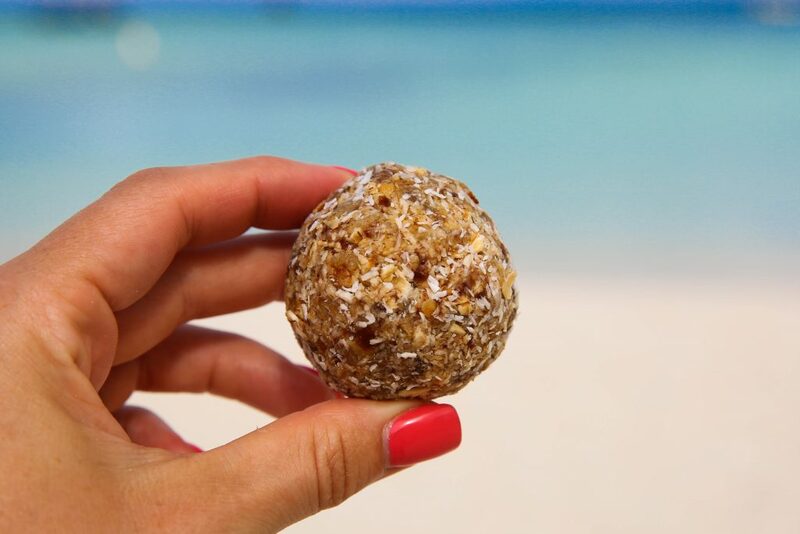 Staying healthy and thriving on vacation has never been easier! Now excuse me, I need to book some flights! 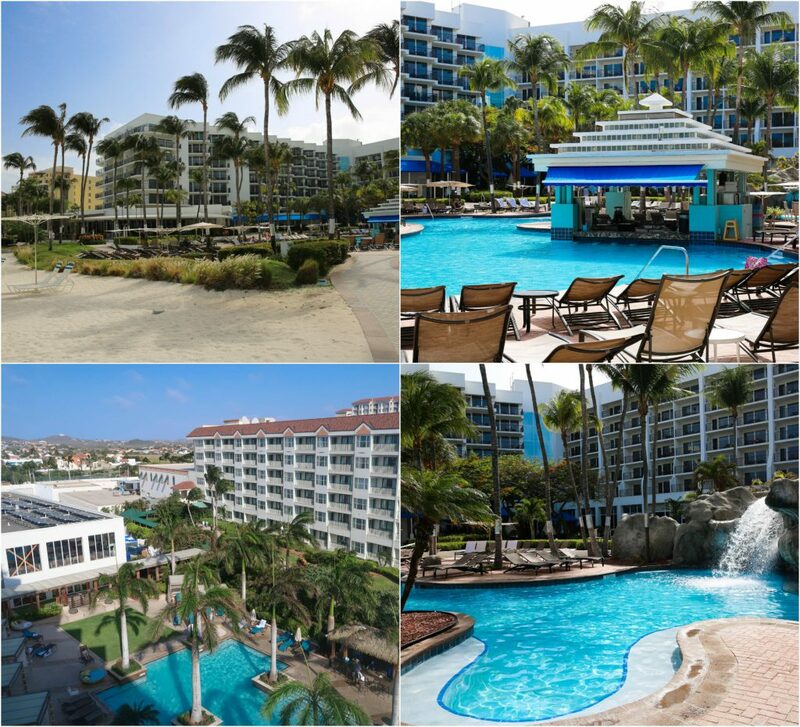 This trip was hosted by Aruba Marriott Resort & Stellaris Casino, but all opinions and experiences are my own! I hope this inspires you to get moving and to stay active on your next vacation! I love this post and seeing your travels! I especially like this one because of the running haha! I am running the Berlin marathon and then we are going to Prague and Munich after eek! wow that will be so fun!! So your IG stories and posts about Aruba already have me planning our family vacation next summer to Aruba! I did some research and was happy to read that Aruba is outside the “hurricane belt” so traveling there in the summer when prices are lower isn’t a risk. Also, that salmon looks amazing! Are you going to recreate it for your blog?? Your travel posts are my favorite! I like hearing about the good and the bad. Plus, knowing where I can eat gluten free when I travel is super important. I love using a race as a reason for vacation! Thanks for the insights! Wow! 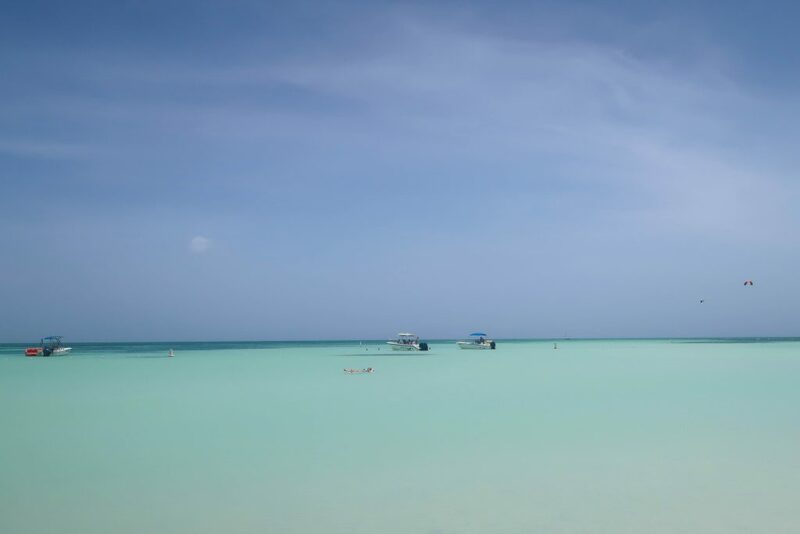 Aruba looks beautiful! I’ve been all over the Caribbean but have never been to Aruba. I always heard it wasn’t that great but this post has changed my mind, its now on my list! it’s seriously AMAZING. i can’t get over how much i love it!